Students earning an online master's in mechanical engineering degree graduate with the skills necessary to work in mechanical engineering. Because mechanical engineers can work in a variety of fields -- including architecture, scientific research, and the automobile industry -- the field boasts high wages and versatile employment opportunities. An online mechanical engineering master's degree prepares you for job stability and career advancement opportunities. What Else Can I Expect From an Online Master's in Mechanical Engineering Program? What are the Best Online Master's in Mechanical Engineering Programs? UF offers online degrees across six engineering departments through its Electronic Delivery of Gator Engineering program. The university's master of science (MS) in mechanical engineering requires 30 credit hours of coursework, comprising 10 courses. Students can enroll in courses in the fall, spring, and summer terms, and they typically complete the degree in 24 months. UF allows master's students to take as many or as few courses as they want each semester. Mechanical engineering students focus their studies in dynamics, systems, and controls; solid mechanics, design, and manufacturing; or thermal science and fluid dynamics. Students must pass a comprehensive final exam in their chosen concentration in order to earn their online master's in mechanical engineering degree. Students who complete a thesis may opt out of the exam. UF is regionally accredited by the Southern Association of Colleges and Schools Commission on Colleges (SACSCOC). Stanford offers an online mechanical engineering master's degree through its Center for Professional Development. The program incorporates research and academic coursework to foster specialized skills in the mechanical engineering discipline. The curriculum comprises 45 units and stresses sustainability and human-centered design. To graduate, students must take fundamental mathematics and engineering courses, plus courses in a specific focus area. Part-time students generally complete this degree in 3-5 years, while full-time learners may finish faster. Students must complete their degree in five years or less. Online learners may have to take a few on-campus courses, since some required courses may not be available online. All students must complete at least one course with a laboratory requirement. Stanford's mechanical engineering department expects students to earn at least a 3.0 GPA in all required courses. Stanford is regionally accredited by the Northwest Commission on Colleges and Universities (NWCCU). UVA offers six online engineering degrees through Virginia Engineering Online. The school's master's degree in mechanical and aerospace engineering requires 10 courses, totaling 30 semester hours of coursework. Students must take at least 15 semester hours through UVA. They may take up to half of the required courses through one of five partner institutions, including George Mason University, Virginia State University, and Virginia Tech. UVA administers most online courses in a synchronous format. The School of Engineering and Applied Science reviews applications throughout the year, and students may start their studies in the spring, summer, or fall terms. Master's students must earn at least a "C" grade in all required courses to graduate. The University of Virginia is regionally accredited by the Southern Association of Colleges and Schools Commission on Colleges (SACSCOC). USC boasts more than 100 online graduate and professional programs, including an MS in mechanical engineering. The program balances conceptual coursework with practical learning, preparing students to continue their education or enter the workforce. Students must complete 27 units to earn the master's degree, and can opt for one of three tracks: thermal and fluid sciences, engineering design, or mechanics and materials. Online students can also complete a dual degree in mechanical engineering and engineering management, which consists of 36 units. Learners may complete the entire curriculum online or visit campus for some courses. The engineering school offers courses both synchronously and asynchronously. Full-time students can expect to complete the curriculum in two years or less, while part-time students often take 2.5-3.5 years. UCLA's online master's in mechanical engineering program provides a broad introduction to the major areas of the mechanical engineering field, including thermodynamics, fluid mechanics, and robotics. The 36-credit curriculum consists of nine courses, five of which must be graduate-level. Students who have not earned a bachelor of science from a mechanical or aerospace engineering program accredited by the Accreditation Board for Engineering and Technology must take two foundational courses in aerodynamics and materials. Students must take a capstone course or pass written exams in three graduate-level courses to graduate. Students typically earn the degree in just over two academic years, and may not take more than nine quarters (three years) to finish it. Applicants must have at least a3.0 GPA in their last two years of undergraduate coursework to gain admission to the program. UCLA is regionally accredited by Western Association of Schools and Colleges (WASC). Students at the University of Illinois at Urbana-Champaign can choose from two online mechanical engineering master's degrees: an MS, and a master of engineering (M.Eng.). Both programs incorporate many of the same courses, but each has slightly different requirements. Both programs consist of 32 credit hours of coursework. MS students must complete a thesis or an independent research project. M.Eng. students must take four credit hours of professional development courses, such as technology entrepreneurship, high-tech venture marketing, or finance for engineering management. The MS degree usually takes two years to complete, while the M.Eng. degree boasts an accelerated option that allows students to finish in one year. Applicants to the online MS program do not have to report GRE scores. All prospective students must demonstrate a 3.25 GPA in their last 60 semester hours of undergraduate study. The University of Illinois at Urbana-Champaign is accredited by the Higher Learning Commission (HLC). NC State offers more than 90 distance education programs, including an MS in mechanical engineering. Students can complete the entire 30-credit-hour curriculum online, and NC State delivers online courses through its WolfWare platform. Each student must take three credit hours of project work in mechanical engineering, in which students develop practical experience by investigating engineering problems. NC State allows master's students to take three graduate-level courses in any engineering or mathematics discipline. In addition, distance students may register for up to three on-campus courses. NC State requires applicants to the MS in mechanical engineering program to earn at least a 3.0 GPA from an accredited undergraduate institution. The school does not require GRE scores for admission. Transfer students can typically transfer up to 12 hours into an NC State graduate program. NC State is accredited by the Southern Association of Colleges and Schools Commission on Colleges (SACSCOC). The mechanical engineering master's program at SIT provides students with the conceptual foundation and skills necessary to design, produce, and test high-quality products. The curriculum is made up of 10 courses, amounting to 30 credits. Students must take four courses in a concentration area, such as pharmaceutical manufacturing, medical devices, and micro/nano systems. Stevens delivers online courses through its WebCampus platform, and recommends online learners spend 8-12 hours per week on each course. Students earning their master's in mechanical engineering online through Stevens can opt for an accelerated one-year program. Stevens' Continuing and Professional Student Care Center assists distance learners with admissions, billing, and course registration. Monthly WebCampus newsletters help students stay up-to-date on new resources and technologies. To graduate, students must maintain a "B" average in all required courses. Stevens Institute of Technology is regionally accredited by the Middle States Commission on Higher Education (MSCHE). Johns Hopkins' online master's degree in mechanical engineering introduces students to advanced techniques and technologies they can use to solve engineering problems. Students must complete 10 courses within five years to earn the degree. Johns Hopkins administers online courses asynchronously, but many courses incorporate weekly synchronous office hours, during which students can interact with each other and their instructors. Some notable online courses include dynamics of robot and spacecraft, and biomechanics of cell and stem cells. Students should expect to spend around 10 hours per week on each course over the 14-week academic term. In addition, the program allows students to complete the curriculum fully online, or to incorporate on-campus courses. Admitted students typically earned at least a 3.3 undergraduate GPA, though Johns Hopkins does not enforce a specific minimum requirement. Johns Hopkins University is regionally accredited by the Middle States Commission on Higher Education (MSCHE). UT Austin offers an executive master's in mechanical engineering degree, available fully online. UT Austin delivers all online courses asynchronously, but students complete coursework in a cohort. Students can complete the 30-credit-hour curriculum within two years. The program consists of 10, three-credit courses, including an engineering economics course that covers decision-making and risk evaluation in an engineering environment. Through the program, students obtain the skills they need to manufacture successful products while employing cutting-edge technologies. UT Austin reviews applications year-round, and encourages prospective students to apply early. Applicants must have completed at least 12 months of professional industry experience before applying. The school does not accept transfer credits for this program. All new students must attend orientation, and distance learners can participate on-campus or online. UT Austin is regionally accredited by the Southern Association of Colleges and Schools Commission on Colleges (SACSCOC). Founded in 1754, Columbia University is an elite private institution located on Manhattan's Upper West Side. The university's engineering school offers more than 40 distance degrees and certificates through the Columbia Video Network (CVN). Students in the mechanical engineering master's program can complete their degree entirely online. CVN delivers courses in an asynchronous format, and students access lectures on their own time. Online students work with an adviser to develop a specialized program of study that satisfies the 30-credit requirement. Students must design their coursework around a particular focus area, and must take at least one mathematics course that pertains to their concentration. Students earn the degree in 3.5 years on average, and the school lets students take summer courses to accelerate their studies. Columbia allows students to transfer in up to six credits to the MS program. Columbia University is regionally accredited by the Middle States Commission on Higher Education (MSCHE). Purdue University designed its online master of mechanical engineering degree for professional engineers who want to advance their skills and conceptual knowledge. Purdue invites students to specialize in one of 10 focus areas, including unique options such as acoustics and noise control, design and computer-aided design, and energy utilization and environmental control. Purdue delivers the 30-credit curriculum in an asynchronous format, and students can select a thesis or non-thesis option. Each online class features TAs who support distance learners, and professors set aside specific office hours for online students. Admitted students typically earned an undergraduate GPA of 3.7 and a GRE quantitative score of at least 162. Applicants to this program must hold a bachelor's degree in mechanical engineering; those with other degrees can apply to the online MS in engineering program. Purdue accepts up to 12 transfer credits from accredited institutions. Purdue University is regionally accredited by the Higher Learning Commission (HLC). The University of Wisconsin-Madison's master of mechanical engineering in polymer science program introduces students to traditional plastics and the novel ways polymers contribute to the electronics, nanotechnology, pharmaceutical, and biomedical industries. Students develop a strong knowledge of polymer processing and applications through course topics including injection molding and composite materials. Students generally take 2-4 years to complete the 30-credit curriculum, which the university offers completely online. Online learners progress through courses according to the campus schedule, and must submit weekly assignments. Distance students should expect to spend 20-30 hours each week completing coursework. The University of Wisconsin requires a 3.0 GPA for admission, but may admit students with lower GPAs on a probationary status. Online students receive dedicated advisers who respond to questions and requests within 24 hours. The University of Wisconsin-Madison is regionally accredited by the Higher Learning Commission (HLC). With more than 100 years experience in distance education, Penn State launched World Campus in 1998, giving learners the ability to earn their Penn State degree entirely online through asynchronous coursework. Their online mechanical engineering program is identical to the resident instruction program – the same courses taught by the same graduate faculty who are active in research and experts in their fields of study. Diplomas awarded to online students are identical to those earned by on-campus students. The courses in the 32-credit online Master of Science in Mechanical Engineering curriculum can help you gain advanced knowledge for research, analysis, and design in mechanical engineering. You'll study topics such as heat transfer, the foundations of fluid mechanics, the principles of turbomachinery, automatic control systems, solid mechanics, and engineering optimization. Penn State does not require online learners to attend classes at any particular time, but students must complete assignments and exams by specific deadlines. Online students gain access to career counseling, tech support, and tutoring resources. The program requires applicants to have earned a 3.0 GPA in their last two years of undergraduate study. Pennsylvania State University is regionally accredited by the Middle States Commission on Higher Education (MSCHE). Based in Orlando, Florida, UCF offers more than 60 online bachelor's degrees, graduate degrees, and certificates. For the online MS in mechanical engineering, students may choose between the mechanical systems or the thermofluids tracks. Both tracks consist of 30 credit hours, and require the same core courses in mechanics, dynamics, and engineering. Mechanical engineering students must also complete an independent learning component in the form of a thesis or a research methods course. Though UCF offers most mechanical engineering courses online, distance learners may have to take some courses on-campus. Online students can take advantage of the University Writing Center through live online consultations with tutors. In addition, online learners receive academic and career advising. The University of Central Florida is regionally accredited by the Southern Association of Colleges and Schools Commission on Colleges (SACSCOC). Villanova University offers nine online engineering master's degrees through its e-Learning program. Students can earn the MS in mechanical engineering entirely online, but they may not enjoy access to all the same courses as on-campus students. Villanova's 30-credit-hour mechanical engineering curriculum covers well-established fields like thermal sciences, mechanics, and materials. The curriculum also touches on the emerging fields of bioengineering and nanotechnology, boasting classes such as biomechanics of soft tissues and microscale heat transfer. Online learners attend lectures synchronously, and move through courses at the same pace as on-campus students. Full-time students can earn the degree in two years, while part-time learners who take one course per semester finish in three years. Villanova requires a 3.0 GPA for admission. In addition, applicants from undergraduate institutions that do not possess ABET accreditation must earn a GRE score of at least 155. Villanova University is regionally accredited by the Middle States Commission on Higher Education (MSCHE). Lehigh University offers nine online master's degrees, as well as four graduate-level certificates. Lehigh employs two platforms to deliver its online degrees: Classroom LIVE connects distance learners and professors in real-time, while Classroom Online supports asynchronous learning. The online MS in mechanical engineering program consists of 30 credit hours. Fifteen credit hours come from required core courses, such as analytical methods in engineering and integrated product development. Students also take nine credit hours of elective courses, which can fall outside of the engineering field. Engineering students complete the remaining six credit hours through a master's thesis, through which they must create a high-quality poster and contribute research to the department website. Lehigh allows students to transfer up to 9 credits from another accredited graduate program to the mechanical engineering program. The school highly recommends applicants to submit GRE scores. Lehigh University is regionally accredited by the Middle States Commission on Higher Education (MSCHE). Established in 1865, Worcester Polytechnic Institute offers several online degrees, including the 30-credit MS in mechanical engineering. Students must take 18 credits in mechanical engineering, three credits in mathematics, and nine credits of electives. Worcester Polytechnic Institute delivers most courses in an asynchronous format, though some courses employ live video conferencing and other synchronous methods. The biomedical robotics course covers innovative applications of robotics in medical areas such as surgery, imaging, and rehabilitation. Online learners typically spend around 15 hours per week studying outside of class, and can complete the master of science in mechanical engineering online in two years. Distance learners gain access to on-campus resources such as the Career Development Center, where they can schedule Skype appointments with advisors. To increase the chance of admission, the school recommends that applicants submit GRE scores. Worcester Polytechnic Institute is regionally accredited by the New England Association of Schools and Colleges (NEASC). UW awards distance education degrees through its department of Professional and Continuing Education. The school offers 17 online master's degrees, including an MS in mechanical engineering, which prepares students for advanced roles in the mechanical engineering field. Part-time students can complete the 42-credit program online in 3-4 years, while full-time learners finish in two years. The school offers both thesis and non-thesis options, and students pursuing the non-thesis track can complete nine credits of independent research. The mechanical engineering program incorporates one course in computational or numerical analysis, and two courses in engineering analysis. The Department of Mechanical Engineering requires a 3.3 overall undergraduate GPA and a GRE quantitative score of 155. Students without an undergraduate degree in engineering must complete prerequisite undergraduate coursework before enrolling. Distance learners may start the degree in any quarter. The University of Washington is regionally accredited from the Northwest Commission on Colleges and Universities (NWCCU). Rensselaer Polytechnic Institute developed its distance master of engineering in mechanical engineering for professional engineers looking to advance their careers. The program blends online learning with courses offered at Rensselaer's Hartford, Connecticut location. The curriculum consists of 30 credit hours, including a six-credit-hour capstone requirement. In their last two semesters, students work under the supervision of a faculty member to complete an advanced project and report. The curriculum stresses leadership and management skills needed to advance to high level roles in the mechanical engineering industry. One course introduces the Lean Six Sigma method of workplace efficiency, while another covers engineering management strategy. The program features an accelerated admissions process, and applicants hear back within two weeks. Prospective students must submit an application, official transcripts, a resume, a personal statement, GRE scores, and two letters of recommendation. Rensselaer Polytechnic Institute is regionally accredited by the Middle States Commission on Higher Education (MSCHE). Texas A&M online offerings include more than 70 programs of study, including 47 graduate degrees. Students can complete the 30-credit master's in mechanical engineering online or on-campus. In addition to at least 24 credits of mechanical engineering courses and two electives, students must prepare a portfolio of graded course materials and research. The program also requires students to take modeling and analysis of mechanical systems to satisfy a mathematics requirement. Some unique online courses in Texas A&M's mechanical engineering program include lubrication theory, theory of elasticity, and optical techniques for engineers. The university delivers courses both synchronously and asynchronously. Applicants must submit an official transcript, GRE scores, a statement of purpose, and three letters of recommendation. Master's applicants may submit a resume. The program reviews requests to transfer credits on a case-by-case basis. Texas A&&M is regionally accredited by the Southern Association of Colleges and Schools Commission on Colleges (SACSCOC). 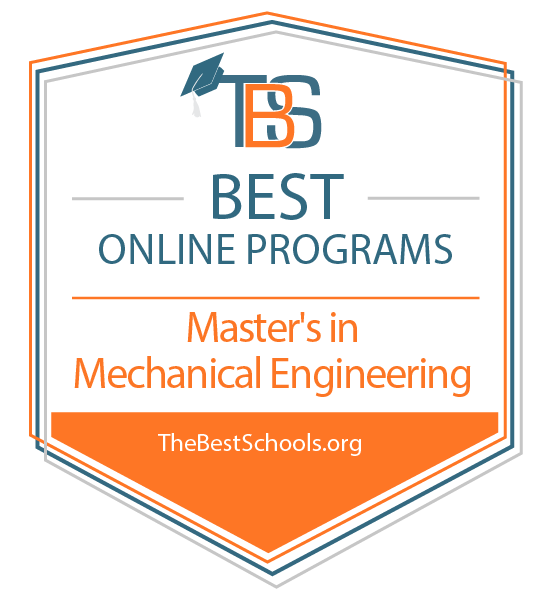 The University of Alabama's MS in mechanical engineering ranks as one of the best online mechanical engineering master's programs. Students can complete the 30-credit-hour curriculum completely online. Students study asynchronously, but they receive the same course material as on-campus learners. The university records campus lectures and makes them available to distance learners. The program boasts 23 focus areas, including fatigue and fracture mechanics, and renewable and sustainable energy. The online program does not offer a thesis track, but students must pass a comprehensive exam to graduate. The mechanical engineering program expects applicants to have at least a 3.0 GPA and a bachelor's degree in mechanical engineering. Those with degrees in other fields may need to take prerequisite courses. The program requires a combined verbal and quantitative GRE score of 300, or five years of industry experience. The University of Alabama is regionally accredited by the Southern Association of Colleges and Schools Commission on Colleges (SACSCOC). The Georgia Institute of Technology's online MS in mechanical engineering teaches students the advanced techniques and innovative strategies that engineers utilize to solve problems. The program also fosters organizational and leadership skills through courses in engineering management, legal issues, and technology ventures. Some unique engineering courses include rotordynamics, mechatronics, and tissue engineering. The institute administers online courses in an asynchronous format, but courses follow the school's academic calendar. Students can complete coursework at their convenience, but must finish each course in a particular time frame. Students enrolled in two three-credit courses should expect to spend 18-20 hours each week on coursework. Online learners gain access to the same support resources as on-campus students. In addition, the school provides online learners with access to collaboration tools such as BlueJeans, Skype, and WebEx. The Georgia Institute of Technology is regionally accredited by the Southern Association of Colleges and Schools Commission on Colleges (SACSCOC). Texas Tech University's fully online MS in mechanical engineering emphasizes design, materials, and mechanics. Students may add other concentration areas later on in their studies. Texas Tech's MS in mechanical engineering program offers both a report track and a courses-only track, both of which comprise 36 credit hours, including nine hours in a student's concentration area and six hours of electives. Learners in the report track must complete a three-credit master's report, while those in the courses-only track must pass a comprehensive exam. Online and onsite engineering students register for the same courses; Texas Tech broadcasts distance courses in real-time so online students can participate synchronously. Students also enjoy the option to study asynchronously, viewing recorded lectures at their convenience. Texas Tech does not enforce a minimum GRE score, but admitted students earn an average combined score of about 1170. Texas Tech University is regionally accredited by the Southern Association of Colleges and Schools Commission on Colleges (SACSCOC). The University of Cincinnati's online mechanical engineering program focuses on developing students' professional and technical abilities. It emphasizes industry-specific skills through courses topics on production planning, applied leadership, and occupational safety. The university delivers the mechanical engineering master's degree online in an accelerated format. Terms run seven weeks, and students can complete the 30-credit-hour program in 18 months. The curriculum incorporates a three-credit capstone course, during which students must complete a project, write a formal report, and present their findings to a group of faculty members. Applicants must hold a bachelor's degree from an ABET-accredited institution, and a GPA of at least 3.0. Prospective students who do not meet either of these requirements must submit GRE scores. Applicants must also write an essay on how the master of engineering program will advance their careers. The University of Cincinnati is regionally accredited by the Higher Learning Commission (HLC). The University of Delaware offers an MS in mechanical engineering program, available either entirely online or in a blended format. The curriculum comprises 30 credits, made up of 10 courses. Students can complete the program in as little as 24 months, or up to 60 months. The program covers fundamental areas of mechanical engineering, such as fluid mechanics and heat transfer, while also introducing students to developing fields such as clean energy, biomechanics, and smart cities. Students can satisfy up to 18 credits through electives. Distance students may opt for the thesis, though this requires some campus visits. Applicants must demonstrate a GPA of 3.0 in all undergraduate engineering, science, and mathematics courses. Prospective students must also earn a combined quantitative and verbal score of 308 on the GRE. The University of Delaware is regionally accredited by the Middle States Commission on Higher Education (MSCHE). Case Western Reserve University created its online master's in mechanical engineering for those looking to switch to the engineering profession or gain specialized knowledge to advance their engineering careers. Students complete coursework asynchronously, and can finish the degree in as little as 18 months. The curriculum consists of 30 credit hours, including seven required courses and three technical electives outside of mechanical engineering. Students may select electives in areas such as biomedical and civil engineering. Case Western prefers applicants who hold a BS in engineering, but also considers applicants with different degrees, as long as they demonstrate a strong knowledge of mathematics and sciences. Case Western waives the GRE requirement for some applicants, including those with five years of professional engineering experience, professional engineering licensure, or another master's degree. The program features three start dates throughout the year. Established in 1870, Missouri S&T offers around 70 graduate-level distance learning programs, including 17 master's degrees. Students may complete the 30-credit MS in mechanical engineering entirely online. The university delivers most online courses asynchronously, and students can view archived lectures on their own time. However, some professors require occasional live attendance for student presentations or other requirements. Students may choose either a thesis or a non-thesis track, and can complete the degree in 3-4 years, while taking 1-2 courses each semester. The university requires a minimum undergraduate GPA of 3.0, and applicants must hold a bachelor's degree in mechanical engineering or a related discipline. Prospective students must attain a quantitative GRE score of at least 155, and a combined verbal and quantitative GRE score of at least 302. Iowa State University's online mechanical engineering master's degree features flexible requirements and a fully online format. Students must complete 30 credit hours of coursework, and they may register for 15 credits outside of the mechanical engineering department. Iowa State does not require mechanical engineering students to take any specific courses. Instead, students consult with a faculty member and the program of study committee to design a curriculum that fits their interests. Iowa State University delivers online courses in an instructor-paced format, in which courses have predetermined end dates and instructors set specific deadlines for assignments. Most engineering courses also feature a live viewing option. To encourage academic integrity, some courses require students to find a proctor to administer exams. Online learners gain access to the school's Academic Success Center, which provides peer tutoring and other support services. Iowa State is regionally accredited by the Higher Learning Commission (HLC). Through its engineering outreach program, the University of Idaho offers an online master of engineering in mechanical engineering degree. The university designed this degree for professional engineers who wish to advance into roles as project managers or project engineers, and the curriculum emphasizes practical skills over research and design theory. The program requires no thesis and includes 30 credits of coursework. The University of Idaho requires an undergraduate GPA of 3.0, plus a degree in mechanical engineering or a related field from an ABET-accredited program. Applicants who did not attend an ABET-accredited engineering program must earn the following GRE scores: 151 verbal, 153 quantitative, and 4.0 in analytical writing. The school also requires applicants to submit three letters of recommendation, a statement of career objectives, and a resume. Students in an online master's in mechanical engineering program study topics like manufacturing, fluid mechanics, and structure design with computers. Coursework correlates directly with tasks students will complete daily in their careers. Many programs feature concentrations for students who wish to tailor their education to specific career goals. At each university, mechanical engineering programs differ. Some programs feature on-campus components like short residencies while others are fully online. The coursework and concentrations each program offers depend on faculty specializations. Additionally, some programs require students to complete components like a thesis or a final project. While online master's in mechanical engineering programs are different at each school, students can expect to classes on the same general topics. The mechatronic system design course introduces students to feedback and feedforward control concepts. Students design software and hardware for systems with electrical, mechanical, and fluid components. In this course, students investigate technical communication in the engineering workplace. They learn to draft, edit, and revise communications for internal and external use. In this course, students learn about computational methods for design, analysis, and optimization of structural components. They review basic concepts in geometric modeling, structural optimization, and finite element analysis. In manufacturing processes, students study the fundamentals of different manufacturing processes like heat treating, casting, particulate processing, machining, forming, joining, and surface processing. The fluid mechanics course focuses on integral and differential conservation laws, exact solutions, and Navier-Stokes equations. Students learn about thermal effects, instability phenomena, and the Laminar boundary layer theory, among other approximate methods. Graduates with their online master's in mechanical engineering are eligible for advanced careers in the field. Many positions in mechanical engineering focus on testing and developing products. Mechanical engineers are responsible for designing, building, and testing thermal and mechanical devices. Mechanical engineers oversee the manufacturing process and analyze test results to improve performance. They work primarily in machinery manufacturing, computer and electronic product manufacturing, and transportation equipment manufacturing. Responsible for designing spacecrafts, satellites, aircrafts, and missiles, aerospace engineers test prototypes to ensure proper function. Aerospace engineers also inspect malfunctioning products to find potential solutions. They determine if potential projects will result in safe operations as they appear in goals. In charge of testing, operating, and maintaining electromechanical equipment, electromechanical technicians repair and calibrate pneumatic and hydraulic assemblies. They read schematics, blueprints, and diagrams to create sequences of assembly for machines.